The Structure Model Index has some well-known flaws, including not accounting for concave surfaces, which make it unsuitable for use on real bone geometries. Ellipsoid Factor is a new replacement for the structure model index and other methods for measuring rod/plate geometry. It uses the axis lengths from prolate, oblate and intermediate elipsoids to determine how prolate or oblate the trabecular space is at a particular point. Highly prolate (javelin-shaped, rod-like) ellipsoids have a single long axis (c) and two short axes (a, b) such that a < b << c , whereas highly oblate (discus-shaped, plate-like) ellipsoids have two longer axes (b, c) and one much shorter axis (a) so that a << b < c. Calculating EF as the difference in ratios, EF = a/b - b/c leads to a useful scale ranging from -1 (oblate, a/b ~ 0; b/c ~ 1) to +1 (prolate, a/b ~ 1; b/c ~ 0). EF of 0 indicates an intermediate ellipsoid where a/b = b/c, which is the case for spheres (a = b = c) and other ellipsoids with axis ratios a:qa:q²a. 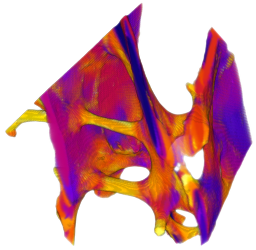 Ellipsoid Factor runs Skeletonise 3D, to get the medial axis of the trabeculae, which is used as the seed for sampling. Ellipsoids are seeded from each voxel on the medial axis. A combination of dilation, contraction, rotation and a small amount of translation is run iteratively until the ellipsoid increases no further in volume. Maximum iterations: how hard to try to find larger ellipsoids - fitting will stop if no improvement has been made after this number of iterations. Max id image: stack containing the ID of the largest ellipsoid at each point; IDs relate to the sort order based on volume, so ID = 0 is the largest ellipsoid. -1 is foreground and background is labelled with a large negative number. This file last modified 1119hrs 14 October 2015 © Michael Doube 2004-2019 :: Designed to be interoperable and standards-compliant.